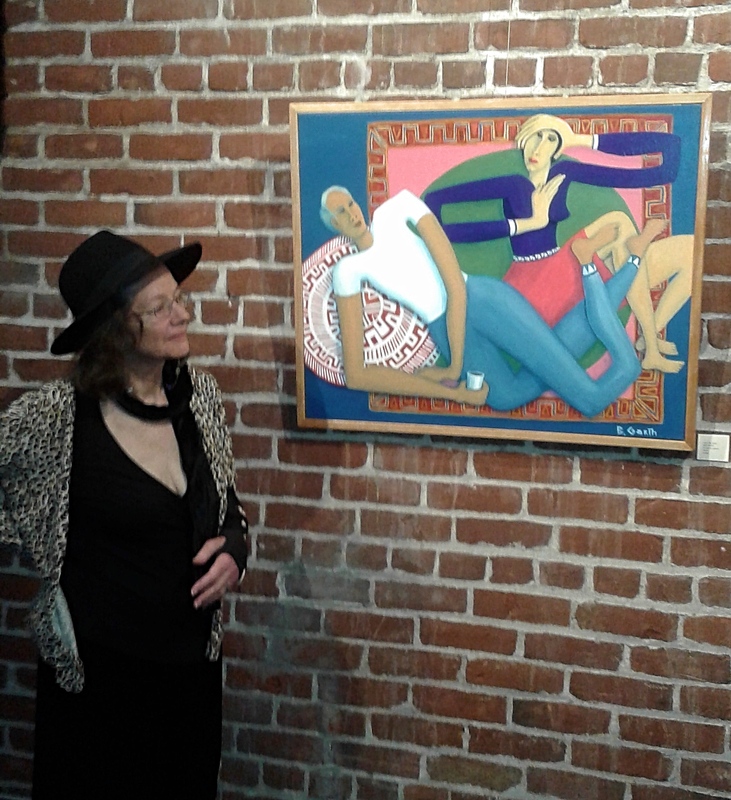 This photo of me standing in front of my newest painting (The Music Genie) is from last night’s reception of my month long exhibit. It was a very fun night while we were entertained by the completely original music by my husband Chris Arcus’ band Climate Strange. I also read poetry to an appreciative crowd. While reading (accompanied by Chris on his keyboard), I realized I often have repeating images of nature, the everyday, eros and relationship, the mythic and the subconscious in both my paintings and poetry that seem to echo each other. 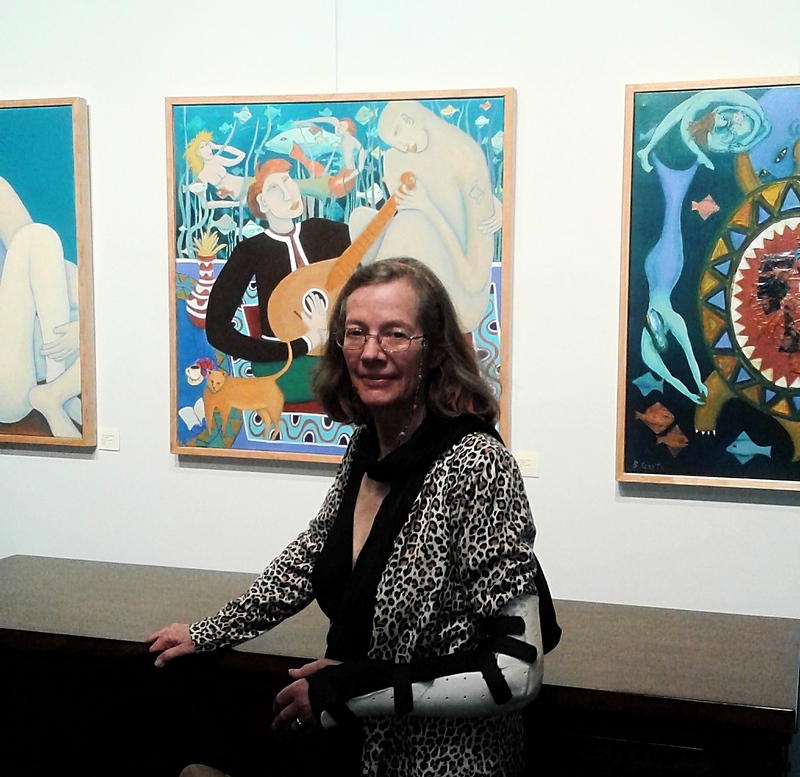 I was very impressed by the beauty of the gallery and how the curator Hazel Miller arranged everything exquisitely. My art and that of Jordan Clark’s was grouped by color and shape for instance–which really works even though he is an abstract painter and I am a figurative one. The Art Gallery At The Cerulean is at 1439 NW Marshall St., on the edge of the Pearl district in Portland, Oregon. The Cerulean is a great place to go to buy wine and a bite to eat, hang out and experience fine art. And yes, you can see I am still sporting an arm brace. I fell while out for a walk and severely injured my left wrist in late December which then required surgery. It likely will take at least 2 more months to heal. I am determined not to let it stop me now that I am a bit better and remember to use ice quite frequently while painting. Am getting better each day–and at managing with one hand for now–with help from my dear husband and our room mate who both help me with food preparation etc.